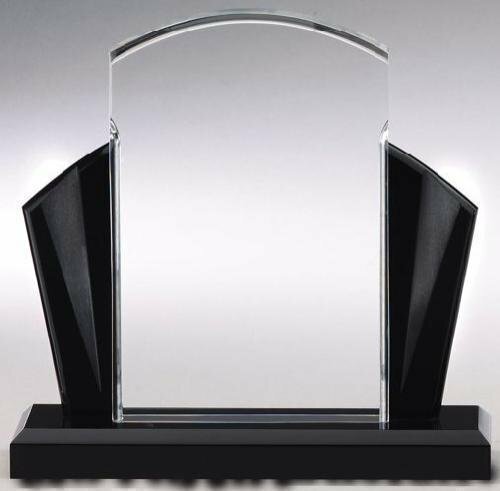 Acrylic Awards with Stand category include acrylic awards that have acrylic and metal stands. 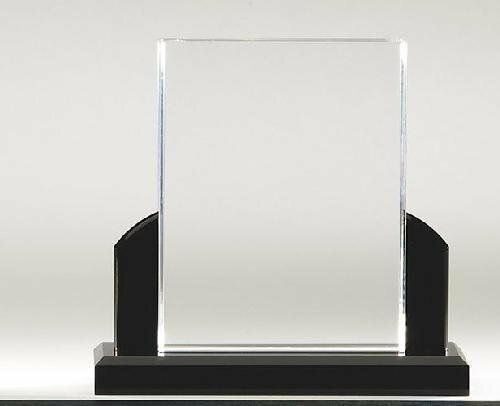 These acrylic awards are shatter resistant, and provide many of the same characteristics as glass and crystal awards at a fraction of the cost. We are pleased to provide a very large selection of the best acrylic awards available today with new acrylic award products being added frequently. This Acrylic and Rosewood Award is an elegant choise. 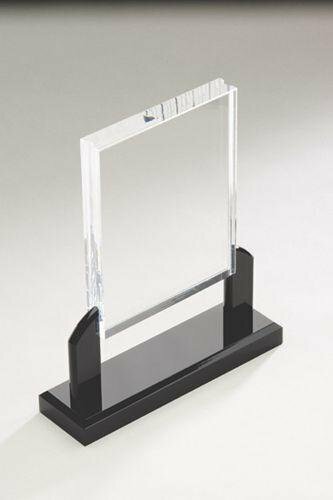 The acrylic award houses an acrylic surrounded by a Piano Finish Rosewood Frame and Base. 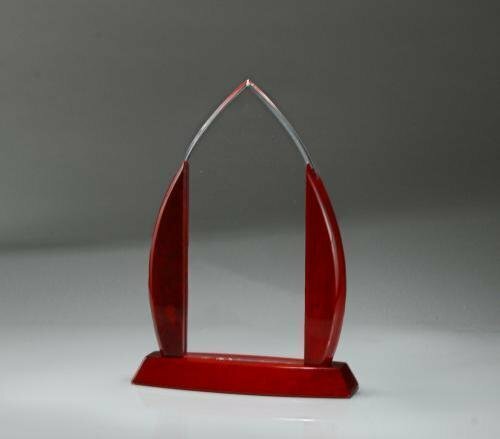 The Acrylic Award on Metallic Base makes an excellent business award. This acrylic award is laser engraved creating a uniquely beautiful award. Your logo can usually be engraved on these beautiful awards at no additional cost provided that vector artwork or a high quality black and white image is uploaded at checkout. FREE Shipping is provided on orders of corporate awards over $100. FREE Engraving is included on each corporate award. Ascent Awards are a 1/2 inch thick clear acrylic. It is supported on a black acrylic arch base with machined aluminum hardware. This award is laser engraved on the back giving the engraving a beautiful depth. 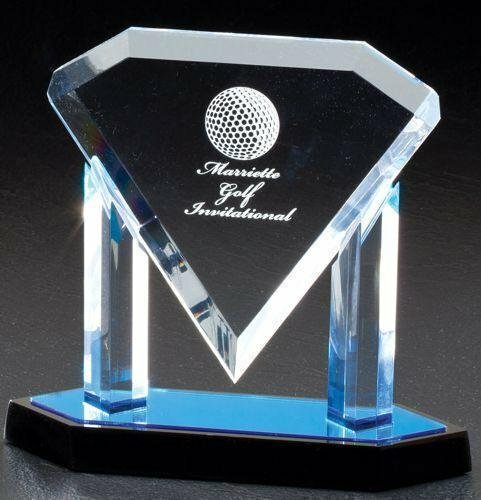 The acrylic trophy is available in two sizes. The listed demensions are approximate. These acrylic awards are individually gift boxed. This acrylic award is laser engraved creating a uniquely beautiful award. Your logo can usually be engraved on these beautiful awards at no additional cost provided that vector artwork or a high quality black and white image is uploaded at checkout. 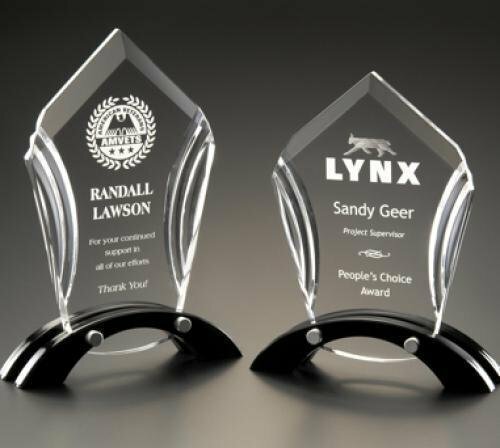 Choose acrylic recognition awards to show your true appreciation. Presenting an acrylic trophy as a business award to clients and resellers encourages continued loyalty. 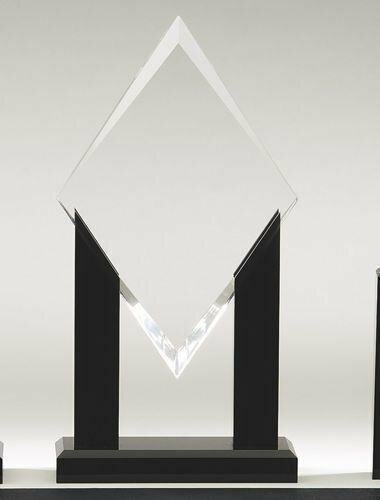 Although business awards include many styles, an acrylic award is certainly an excellent choice for a budget minded recognition award. The Black Apex Acrylic Award makes an excellent business award. This acrylic award is laser engraved creating a uniquely beautiful award. 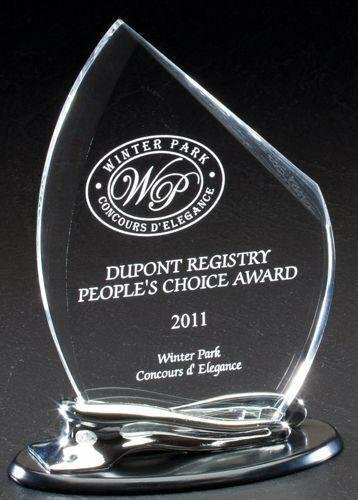 Overall Height: 8.25" Clear Acrylic: 6" x 7.5" x 3/4"
The Black Corner Acrylic Award makes an excellent business award. This acrylic award is laser engraved creating a uniquely beautiful award. 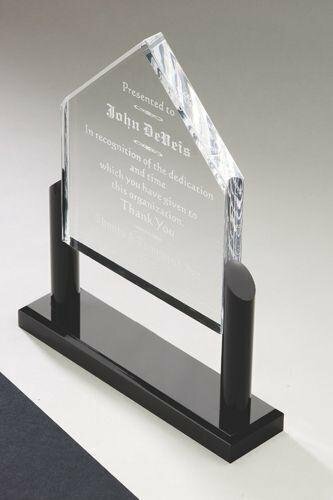 Overall Height: 7" Clear Acrylic: 4.5" x 6" x 1/2"
The Black Diamond Acrylic Award makes an excellent business award. This acrylic award is laser engraved creating a uniquely beautiful award. 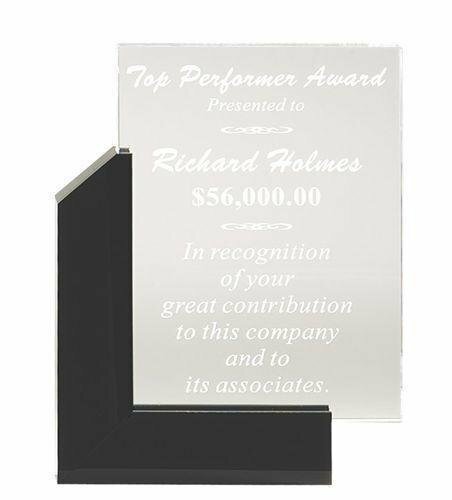 Overall Height: 10.25" Clear Acrylic: 5" x 8" x 1/2"
The Black Elite Acrylic Award makes an excellent business award. This acrylic award is laser engraved creating a uniquely beautiful award. 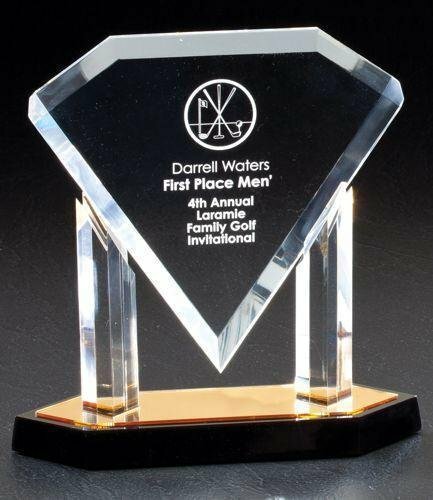 Overall Height: 6.75" Clear Acrylic: 4" x 6" x 3/4"
Overall Height: 7.75" Clear Acrylic: 5" x 7" x 3/4"
The Black Rectangle Acrylic Award makes an excellent business award. This acrylic award is laser engraved creating a uniquely beautiful award. 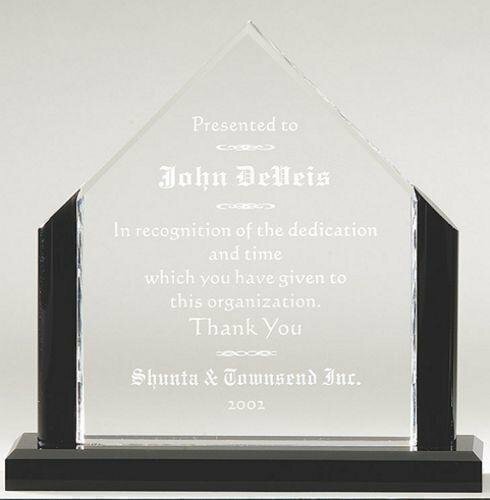 Overall Height: 6.75" Clear Acrylic: 4.75" x 6" x 3/4"
The Diamond Acrylic Plaque makes an excellent business award. This acrylic award is laser engraved creating a uniquely beautiful award.